Shrimp hobby has grown vastly in the past few years. These beautiful tiny creatures have been successful to make space inside most of the aquarists’ heart along the whole wide world. Freshwater Aquarium Shrimps are the most alluring and interesting living beings to exist inside your tank. If you’re searching for a new addition to your community tank or even want to get into breeding, these freshwater shrimps definitely deserve the place in your aquarium. Today, we are bringing you a guide for Freshwater Shrimps for Beginners. Which Shrimp Species are Best for Beginners? Being one of the most popular creatures for both breeders and hobbyists, Freshwater Aquarium Shrimps are undoubtedly the cutest things you can fill inside your tank. Shrimps are very easy-to-care which makes them a great choice. As there are so many Freshwater Shrimp Species, it might be difficult for you to choose which one you should buy. In addition, new species are always being discovered and bred, and it is ever-growing. Moreover, not all shrimps have the same characteristics. They weren’t all created the same, so not all are perfect for every type of tank or community. Let’s get to know more about these fascinating creatures. Dwarf Freshwater Aquarium Shrimps are very active. They are always occupied with algae eating or any other kind of eating. Thus, they are always lively and joyful. As they are small, they are prone to be predated by bigger fishes. 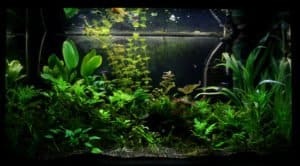 Shrimps acquire the ability to beautify your tank without efforts as they are naturally so pleasing to the eye and mind. 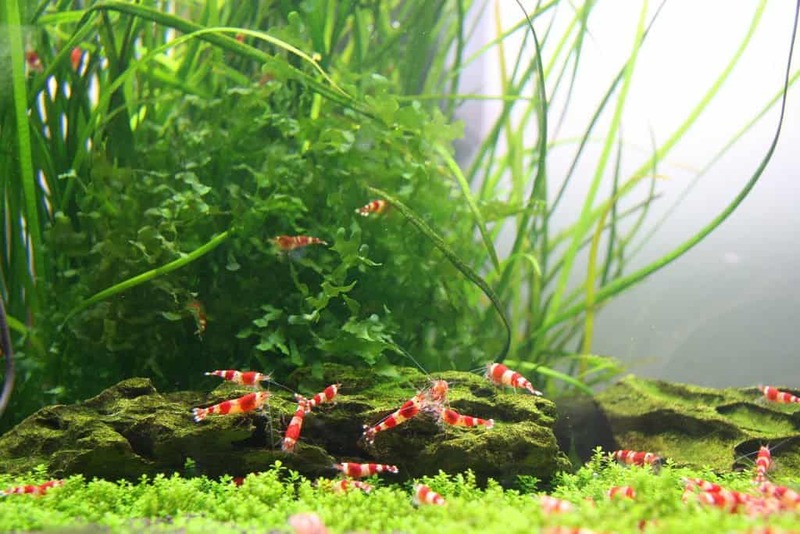 If you find dwarf freshwater shrimp for Sale do not forget to get one! 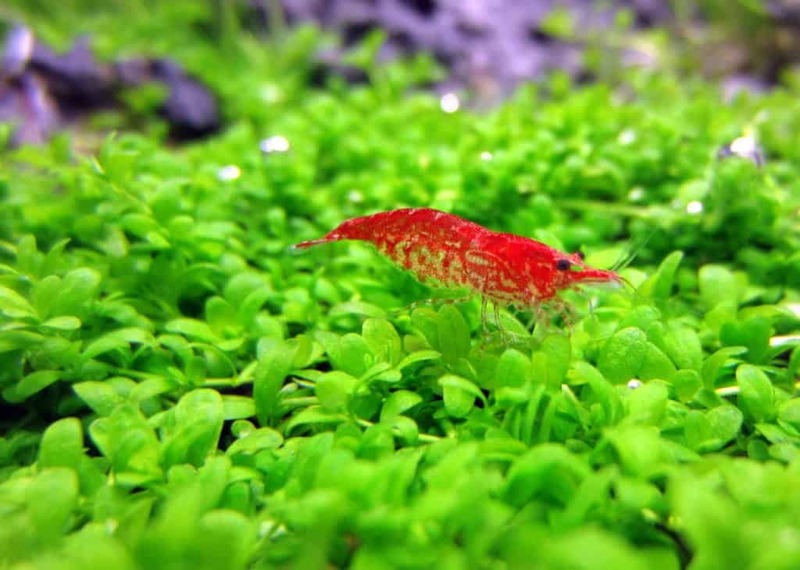 With the help of selective breeding dwarf shrimps come in a wide variety of colors and designs. There are simply too many shrimp species to choose from and almost every species have a wide range of color variants. Their requirements, care level etc. are also different. For a beginner this situation is overwhelming. To keep things simple here is my top 3 choices for the best shrimp for aquarium – 1) Red Cherry Shrimp 2) Amano Shrimp 3) Ghost Shrimp. Shrimps come in different varieties; some are good for community tanks while others are glad to form their own colony in their tank. In this array of different species, which is the right one for you? That is precisely the reason we prepared this article so that you can find the perfect shrimp for you! Without further ado, let’s get right into it. Red Cherry Shrimps, given with Neocaridina davidi var. red as the scientific name, are the most popular specie among the Freshwater Shrimps. Their delightful bright color is what differentiates them along with being one of the easiest to care for Freshwater Shrimps. Suggested Temperature to keep Red Cherry Shrimps is around 18-29.5 °C / 65-85 °F and suggested pH is 6.3-8.0. They make great for being a peaceful community when no aggressive fishes are present. These Freshwater Shrimps also breed very easily. The Ghost Shrimp is unarguably the easiest-to-care for Freshwater Shrimp ever. Palaemonetes sp. is the scientific name for Ghost shrimps. They are both cheap and common for which they are also used as feeders. 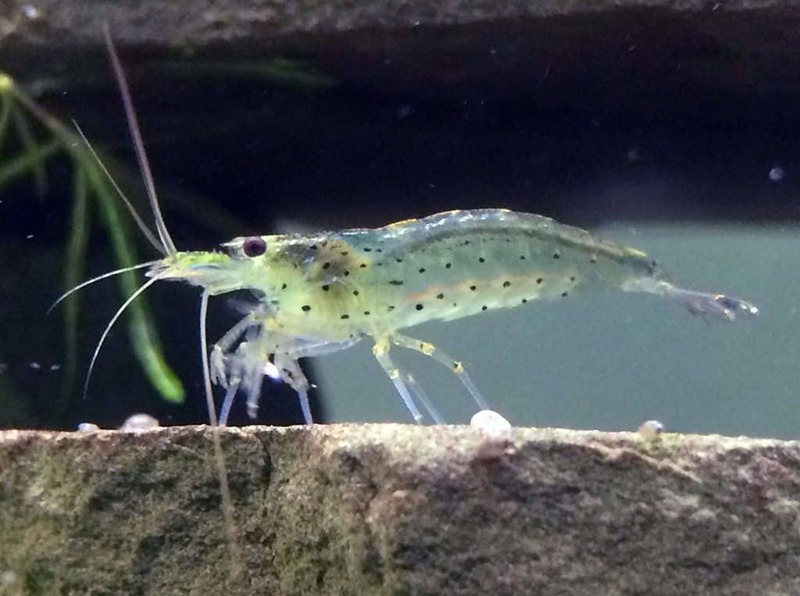 The ideal temperature for Ghost Shrimp Aquarium is anywhere around 70-80 °F/21-26.5 °C and ideal pH level of the water should be around 7.0-7.8. They are known as wonderful scavengers which is another pros. If you want to build a shrimp only tank, these Aquarium Shrimps can be your first choice. Figure out whether your tank setup is fine or not with these species. Snowball Shrimps have Neocaridina cf zhangjiajiensis var. White as their scientific name. Again, these Red Cherry cousins are very easy to care of shrimp. They are also great for beginners. They are very low maintenance which makes them easy pets. You don’t need to elaborate the tank setup or size at all as these freshwater shrimps adapt so well. They can tolerate more fluctuations in water which makes them so easy to keep. They eat almost anything as they aren’t too picky when it comes to food. 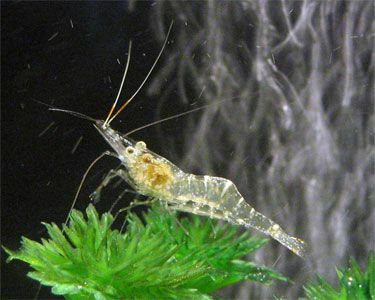 These Shrimps also breed pretty easily as they do not need many specifications in water or tank. They can make a great colony too. They survive in many conditions. Temperature range for these magical creatures is anywhere around 18-29.5 °C/65-85 °F and pH around 6.2-7.8. This big range makes it so easy for them to survive in many conditions. 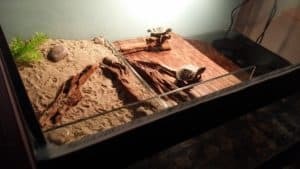 If you’re a beginner and want to set up a shrimp tank, give them a go! Blue Tiger Shrimps are very gorgeous shrimps for your aquarium. Their scientific name is Caridina cf. cantonensis var. ‘Blue Tiger’. These fabulous Freshwater Aquarium Shrimps are wonderful as both decorations and pets. 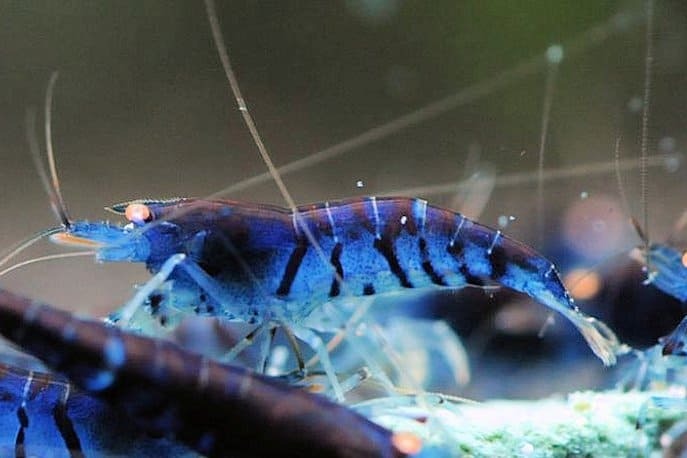 Despite having such stunning deep blue bodies and in addition those tiger stripes, these Blue Tiger Shrimps also have orange eyes that make them look even more gorgeous. However, these beauties are not that easy-to-care for. They are very reactant to ammonia and nitrate. So, be sure you keep them away from those. They should also not be overfed as that can also lead to death. Aquarists will need a bit of experience to keep them. The preferred temperature for them is 65-75 °F/18-24 °C and pH is 6.0-7.5. With such an interesting name, these freshwater shrimps are interesting too. The scientific name for Panda Shrimps is Caridina cf. cantonensis var. “Panda”. At some point, these beauties were too much hyped on the market and had hefty price tags. However, now they are not that expensive yet not so cheap too. Panda Shrimps are also known as ‘Black King Kong Panda’ due to their king like look and panda like color. However, these masterpieces aren’t really easy to maintain. You need to make sure that you have a large enough tank and have the perfect water conditions that these Black King Kong require. Temperature range and pH range for them is 62-75 °F/16.5-24.5 °C and 6.0-7.5. These alluring pieces are not easy to breed. So, if you are looking for a colony, they might not be the best options. However, if you are looking for something exotic for your Freshwater Shrimp Aquarium, they are just the ones you need! Bamboo Shrimps have Atyopsis moluccensis as their scientific name. 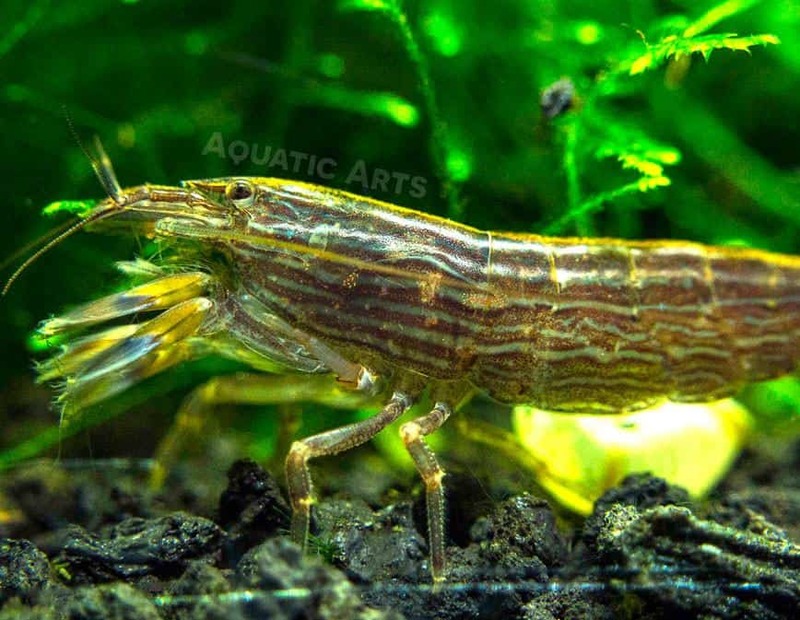 These Bamboo colored Freshwater Shrimps are also known as Wood Shrimps. These are very popular and readily available in most of the stores. These are pretty active and fun to watch shrimps and make a great colony too. They are not aggressive, so they can easily fit in peaceful community tanks. They have a beautiful color and texture of their body. They are very easy to care too, so it makes them very easy to keep for beginners. 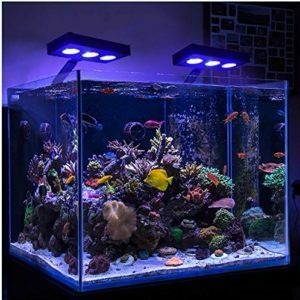 Preferred tank temperature for these soothing creatures should be around 68-77 °F/20-25 °C and the pH level should be around 6.5-7.5. 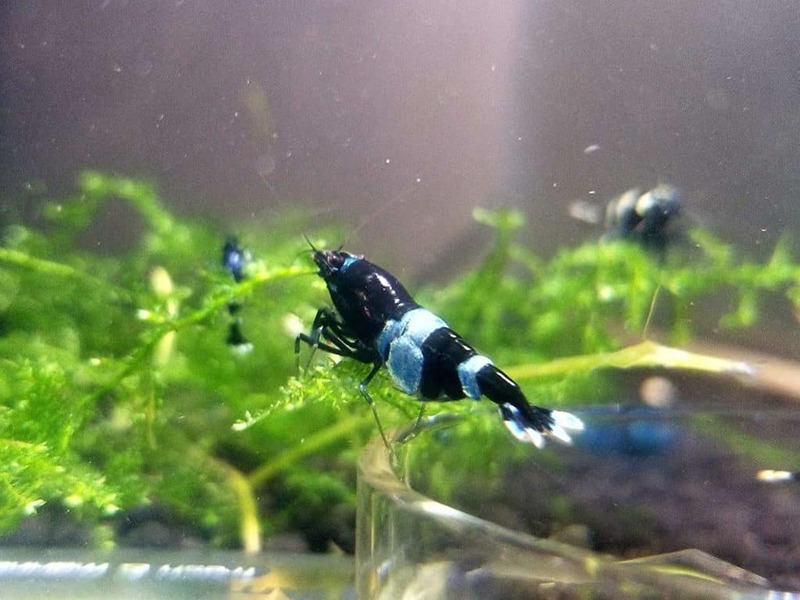 The Blue Bolt Shrimps are mind-blowing species of Dwarf Freshwater Shrimps. Caridina cf. cantonensis var. ‘Blue Bolt’ is their scientific name. They have a combination of Blue, Green and Yellow blend of bright colors. Undoubtedly being an exotic collection for your freshwater tank, these Shrimps are however pretty hard to care of. They are sensitive to nitrites, ammonia, and nitrates so you need to change the water regularly and have an excellent filtration system. These species are rare and hard to find in stores. Estimated temperature of water for these Blue bolts are 18-24 °C/65-75 °F and pH is 6.0-7.5. You need to make sure that the temperature and pH are not below or above the range provided as that can harm these exotic shrimps. Crystal Red Shrimps are also known as Caridina cf. cantonensis var. ‘Crystal Red’ to the scientists. Their name can also be abbreviated into CRS, as many call it by that. Demand for these pretty creatures have increased so vastly over the past few years that experts have started breeding them in big numbers, and as a result, they are also getting some magnificent patterns of these dwarf shrimps. So, these Freshwater Shrimps also cost a bit more than others and are exotic too. The price range depends on the quality and the color. They are pretty hard to care for than others too, but I’m sure their alluring beauty and pattern justify that! 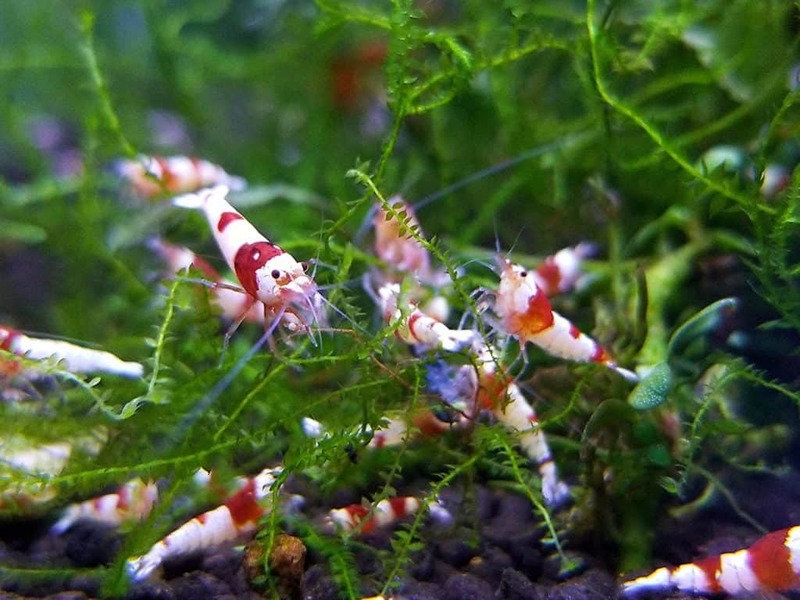 Temperature range for Crystal Red Shrimps is around 18-24 °C/65-75 °F and pH range is around 6.0-7.5. These dwarfs make great for Shrimp tanks only especially when only their own species are present in the Shrimp aquarium. No, the Bumblebee Shrimps are not any kind of Bee Shrimp. They are a whole different species. Scientists gave them Caridina cf. breviate as their scientific name. Their peculiar pattern managed them to get the name Bumblebee. Despite being so beautiful, these shrimps are not that hard to keep. They are also pretty common and relatively easy to take care. However, they are sensitive to ammonia and nitrites so they must be kept at the flawless condition. The preferred temperature for Bumblebee Shrimp Aquarium is 70-80 °F/21-26.5 °C and pH should be around 6.0-7.2. The list couldn’t be completed without the widely popular Amano Shrimps. Scientists call the Amano Shrimps as Caridina multidentate. They have lots of pros to be in most of the aquarists’ Freshwater Shrimp Aquarium. Best known for their large appetite for eating algae, they can be great for keeping your tank clean and beautiful. In fact they are one of the best algae eaters out there. They are very easy-to-care for and also do not require many specifications. However, if you are looking for a colony then these might not be the best of all as they are quite hard to breed. 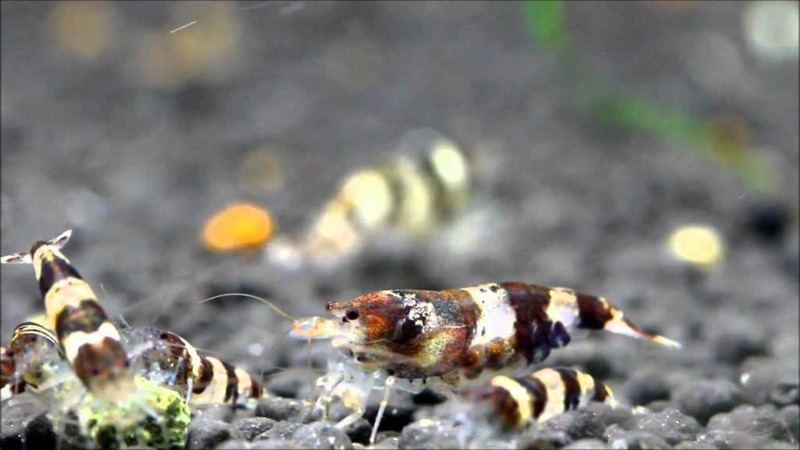 Estimated temperature range for keeping the Amano Shrimp is around 18-29.5 °C/65-85 °F and pH range 6.5-8.0. Thankfully, shrimps are not picky eaters. They usually live on algae, which is very useful for aquarists. This is why they shouldn’t be kept in new tanks. 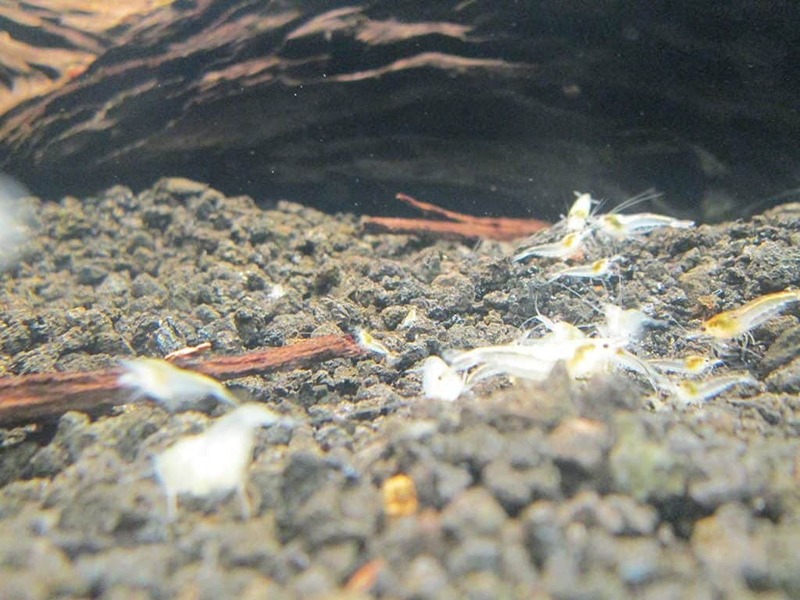 The tank needs to be cycled and matured as these shrimps feed on the biofilm that forms in the aquarium after being cycled. Or else, they would not lead a healthy life. However, after growing up and building a community, they need to be provided with supplements. That’s not a thing to worry about, as they eat almost anything. Very small pieces of spinach, pears or cucumbers also do. Keep in mind that, when it comes to feeding Freshwater Aquarium Shrimps, it’s always better to underfeed them instead of overfeeding. Overfeeding can cause harm to them while slightly underfeeding keeps them pretty good too. 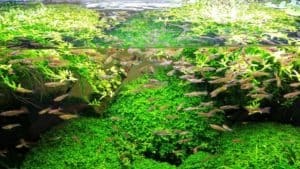 In an aquascaped planted aquarium you may pass days to even months without providing any external foods to your shrimps. The ecosystem is sufficient enough to feed them and keep breeding. 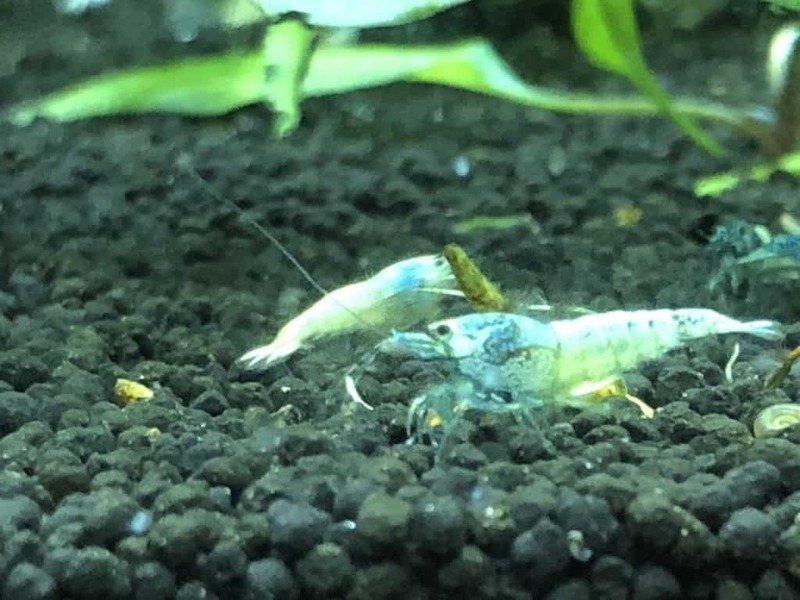 I have documented my journey of shrimp keeping in another blog. You may find it interesting. Unfortunately, there are not many cohabitants available for Freshwater Shrimps specially in the closed ecosystem of an aquarium. Some small fishes can be kept with shrimps but might harm the babies. Otto Cats and small Plecos are good ones to keep as they have small mouths and can’t harm the babies. Fishes like guppies, tetras, and platys are a good choice too as they are small and can’t harm the shrimps. However, if you want to breed the shrimps, then they might not be a great choice as the babies can be a very easy meal for them. So, beware of that. They eat shrimp eggs too. Snails make great mates too! Some snails also act as scavengers and help to keep the tank’s glass clean too. Some examples are Red Ramshorns, Nerite or Trumpet snails. They do not harm the shrimps. 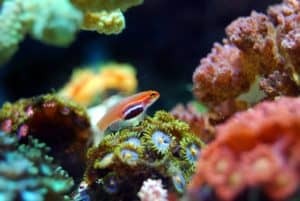 Even if the fishes you keep with shrimps are too small to harm them yet aggressive in behavior, that can cause mental stress to the shrimps and cause illness to them. Freshwater Aquarium Shrimps are great pets to have and can add up a lot more joy in your life. They are both useful for your tanks and can also add cherishment to your tanks along with beauty. If you had any confusions about Freshwater Shrimp Aquariums, that must have been cleared already by reading our ultimate guide to Freshwater Aquarium Shrimps. What are you waiting for then? Go get some shrimps asap!